The second edition of this popular introductory textbook has been fully revised to provide a totally up-to-date guide to the practical aspects of promoting health. Focusing on the range of skills needed to become an effective practitioner, it takes readers step-by-step through the different settings in which health promotion takes place, and the various tools they might employ. The book offers accessible and comprehensive coverage of all the key topics in contemporary health promotion, including chapters on health promotion through the lifespan, one-to-one communication, working with groups, using the media and digital technologies, advocacy, and planning and management. As well as incorporating the most recent government policies and initiatives in public health, the new edition draws on the very latest literature and statistics. In particular, there is new and expanded material on issues such as: community initiatives and social capital; novel resources offered by digital technologies; health literacy; health in the media; stress in the workplace, and much more. Throughout the text there are activities to develop students’ understanding and encourage reflective practice. Each chapter opens with a list of the central issues and learning objectives, and key terms highlighted in the text are clearly explained. Carefully chosen figures and photographs enliven and reinforce the text, while a well-designed website (www.politybooks.com/healthpromotion) offers up-to-date online resources to test and extend students’ learning. The new edition of Practical Health Promotion will continue to be the ideal and indispensable practical guide to health promotion for students at all levels. It will inspire anyone involved with health care to find practical ways of promoting positive change. 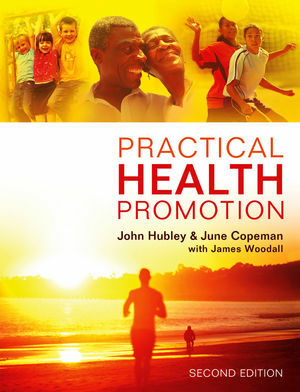 "Packed with examples, activities, definitions and explanations of terms, the second edition of Practical Health Promotion is a clear and helpful guide for those seeking to understand and engage in health promotion practice. Its approach is straightforward and level-headed, never losing sight of the fact that, while often a complex and difficult enterprise, health promotion at its heart is about understanding and improving the lives of individuals, communities and populations." "I am delighted that this second edition continues the good work of the first in competence, sophistication and, above all, practicality! Maintaining the standards of the first edition and taking into account current developments, the new edition maximizes sophisticated understanding with practical application." "Practical Health Promotion provides an excellent overview of this evolving discipline, based on UK health promotion practice, but also useful in other high- or low-income country settings. A wide range of health promotion settings are covered including health facilities, communities, workplaces, schools and institutional settings for the elderly and disabled. The key methods of health promotion are concisely sub-divided into approaches for one-to-one communication, group communication and mass, print and electronic media. This is an excellent book and we highly recommend it to health professionals during their study and practice of health promotion."